Create floating rose centerpieces as tranquil decorations with a new perspective on floral decor. Layer clear bowls or other glassware with shiny filler materials, and let the roses and grasses help these classic table arrangements stand out. Combine stemmed roses and filler flowers to make organic bowl centerpieces that marry greenery with color. Work with mini rosebushes that you can clip, or miniature roses sold in cut bunches. Mini roses have thin stems that are easy to twist into different shapes to accommodate a variety of glass containers. Add the stems to the bowls using a circular motion so they hug the insides of the bowls, using enough so the centerpieces are not too sparse or crowded. For red roses, accent your arrangement with white baby’s breath or use purple statice to trim pastel-colored roses. Once your flowers and fillers are inside the glass, just pour in the water. Or cut the stems of several large rosebuds to an inch and drop the flowers into a half-filled bowl or vase of water. 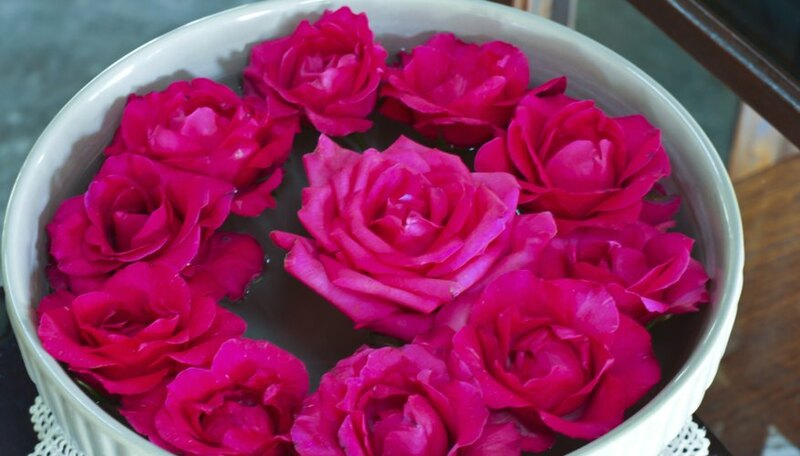 For a more elegant look, float single rosebuds in bowls of water, alone or with beads or marbles on the bottom. Cut the stems close to the flower buds or they won’t float well. Cluster the rose bowls in the center of a table or line them up in a row. For artificial roses, use polished rocks or vase gels to keep the flowers stable. Bring in contoured containers such as asymmetrical shapes or those with tulip-style openings.